Microsoft Launcher is one of the most downloaded launchers on Google Play. With different tools like Cortana, Feed, Dock, Daily Bing Wallpaper etc. it has changed the way we see our phone. Within three years, over 10 million users have downloaded Microsoft Launcher, and with 4.6 rating it competes with significant launchers out there. The demand for the launcher led me to write an honest review of Microsoft Launcher. 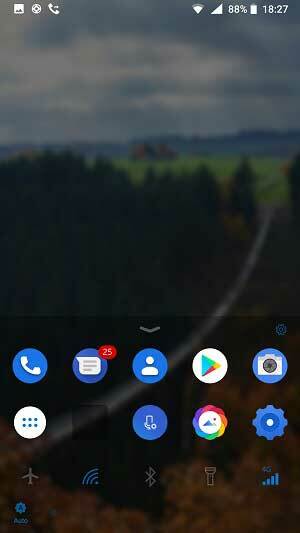 As I have been using Microsoft Launcher on my Nokia 8 for over seven months now and I think everyone should know of this launcher before installing. The article is the ultimate review of Microsoft Launcher on my Nokia 8. Microsoft Launcher released the launcher in 2015. The launcher is considered a lightweight, fast and efficient Android launcher. It brings the old Nokia feeling to the phone. It comes with tools which can be helpful at different times. After installing and setting up the first thing we see is Home Screen. Let’s find out some info and how to navigate. On the Home Screen, we have a Google and Bing Search Bar. Some apps available to open on the screen, while swiping right until the end opens Feed menu. Swiping up opens Apps Menu while swiping down opens the Search menu where you can search for installed apps as well as the web. The small transparent line below the Bing search opens Dock Menu. The feature I like is Bing daily wallpaper. It changes your home screen and lock screen wallpaper every day. You can also download the latest wallpapers and select them as your home and lock screen wallpapers. Like Bixby Home on Samsung, Microsoft Launcher comes with Feed. On the top, you can see your account info with weather, rewards and calendar events. Below account info, we have Bing search bar which also supports camera search. Camera search allows to take a picture of an item or scan a barcode. Feed comes with three menus named Glance, News and Timeline. Glance contains cards including Calendar, Cortana. Recent activities, People, Tips and much more. You can also add and delete cards. The second menu is News, in which you can stay up-to-date with local and international news. The third one is Timeline, which tracks your activities and puts them all together. Feed comes in handy in checking events, news, favourite apps and timeline. You can enable and disable Feed in the settings next to the search bar. Check out: HERE WeGo vs Waze. The best thing about Microsoft Launcher is it sorts the new and recent apps on the top. As you download new apps, the launcher places them on the top and the same with the recent apps. On my Nokia 8, the launcher brings old apps menu look. On the right, we have a column to choose the initial for the app which I barely use because of the search bar on the top. Search finds the app you are looking for instantly. Other than that, you can change menu settings, hide apps, hide recent apps section and even select multiple apps to add to home screen. Holding an app shows you extra options. Some of the apps support these options. The typical options like uninstall the app, find related widgets, add to home and select multiple apps options are hidden in that three dots menu. Another features the launcher is blessed with is changing the app’s name by tapping on the middle option. You can go to app’s info by tapping on the info option on the left. The dock is another excellent tool in Microsoft Launcher. On the home screen, you can quickly access favourite apps and settings by swiping up on the line below the Bing Search bar. Apps like Google Play, Phone, messages, Camera etc. with settings like Wi-Fi, Airplane Mode, Bluetooth, Torch, Mobile Data etc. can be opened from Dock. The feature is similar to iOS’s Control Center, but the look and feel are different. You can customise Dock in “Personalization settings” menu. Without the settings, Microsoft Launcher review is not useful. You can change themes in the launcher. It comes with Light, Dark and Transparent themes. With Light theme, you get a white coloured background, and with Dark, you get black coloured. With Transparent the background wallpaper stays as background all the time. You can change the background blur, opacity, and the accent colour in the settings. The launcher comes with excellent settings to customise. We can change the swipe gestures, Cortana and search settings, and personalise theme, apps, Feed and Dock. Other than that, Microsoft has managed to connect the launcher with PC. The technology is called “Continue on PC”. For example, if you are working on a document, and tap/click “Continue on PC” it would open an app in the browser on PC, and you can continue working on PC. The technology is limited and only works with limited apps, but soon we can see cool apps connecting to PC quickly and without a cord. Without a doubt, the launcher comes with many features for free. Not all launchers provide these features for free. From daily wallpaper to Personalization settings we have options to customise and personalise the launcher. A Microsoft account is required to set up the launcher, but that is not an issue. I hope my article on Microsoft Launcher helped. Which launcher do you use? Is it Microsoft Launcher? Please share your experience with us so we can improve this article. Important information: Images used in this article are the screenshot of the app. A screenshot is most likely copyright of the app owner. If you the copyright owner and want these images to be removed, please send me a message.